at a speed of 80 kilometers per hour. If they continue to fly for two days, these birds can cover a distance of 1600 kilometers or 994 miles. 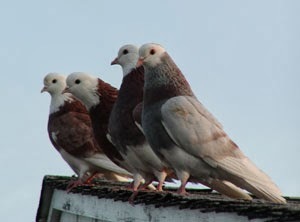 Based on scientific studies, pigeons used various types of methods in finding their lofts. Usually, they would use familiar landmarks, positioning of the sun and magnetic field of the Earth. Apart from that, pigeons also possess good eyesight and are far better than that of human beings. It is because they can see through ultraviolet rays. They are definitely one breed of fascinating birds. The initial step to raise these heroic birds is to cultivate a love for them and of course, love for your own individual pigeons. Spend time with your pigeons and you will realize that these birds can be really affectionate too. Make sure that you provide the most appropriate housing. Their homes should have a loft that is airy but not drafty because it is essential for their health. It is advisable that the loft is elevated for them to easily recognize it. Elevated loft can be seen without any trouble by these birds when they are up in the air. Begin training them by making them comfortable in the basket that you plan to use in transporting them. It is best to leave them inside the crate or box for about an hour or two; in this manner they will become more familiar with their surroundings. This would prevent any anxiety or alarm to be felt by these aviaries. On their first training flight, you may want to take them at least a mile away from their home. Once you have released them, you can go back to their loft and wait for their return. If they have successfully returned home, you can reward them with food. Little by little you can increase the distance of your pigeons’ training flight. For instance, you can add one mile during each flight. 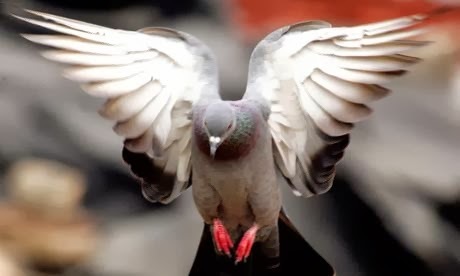 As soon as your pigeon can fly at the distance of more than 10 miles; you can start releasing them in pairs rather than in groups. Continuously increase the distance of the training flight until they can fly at the distance of 70 miles. This is definitely the appropriate distance for the young pigeons to travel. Most of the pigeon races would reach about hundred miles thus you must carefully train them for the race. It does not require so much time to train this type of bird. However, it requires a lot of patience and repetition to train them properly. To begin training them, it is best start with young birds and has not flown yet. Put them in an enclosed area that will serve as their fly pen. Make sure that there is water and food in the loft; this will make it easier for the pigeons to associate their loft with being fed. You can do this with your pigeons for about two weeks. Afterwards, you can open the fly pen and allow the pigeons to go out. They would normally fly around and there is no need to worry about it. Once they become more familiar, even if they fly around they would return to the loft to eat. As soon as the pigeons begin to leave the loft for an hour before they return home; you can already take them out for about five miles. When they know how to return to the loft and they have done it correctly thrice; you may begin to double the distance of the training flight. Repeat this method until it can fly about 50 miles. Flight training can be done at least once a week. You may also want to change the direction every now and then. By doing this, they will get used up in flying from all directions. Every time you change the flying directions, you must begin with flight training at five miles from the loft. Make sure that you feed the birds because they will need a lot of foods during the flight training. Avoid practicing the birds during winter time. They should fly only on clear skies and with a little or no wind at all. These birds should be released twice a day, once in the morning and then in the afternoon. In case you experience losses; then you must slow down with your training. Make sure that you do not over train these birds. You should not scare them whenever they are in their loft. This is the place that the pigeons should feel safe. It was hard to imagine that birds such as pigeons can be trained and used to deliver messages during the time when it was quite difficult to transmit very important information. Indeed, each creature has its own significant role to play in the balance of ecology. But birds being used as channel of communication are definitely an unexpected task done by these birds. You can share your thoughts on this article about carrier pigeons; feel free to comment and if you find the information useful; please share it in social networks.